If you have TB disease of the lungs, it can be spread to others. For this reason, you are treated at first in an airborne infection isolation room in the hospital. The aim of isolation is to prevent the spread of the disease to other patients and staff in the hospital. Effective medication removes the risk of transmission usually in a couple of two or three weeks. This is the time you are isolated in the hospital. In some cases, isolation may last longer. During isolation you are in a single room. You may not leave the room without permission. There is a toilet and shower, a telephone and a TV in the room. Food and medicines are brought to the room. You can also bring some personal items like books and magazines to the room. 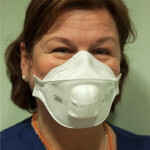 Personnel who are treating you are using respirators. Healthy adults may visit you, but they have to follow the instructions given by health care personnel and use similar respirators. It is recommended to keep the visits short at the beginning of the treatment. If possible, you can be in contact with your relatives and friends through telephone and Internet. Children under 5-years of age and adults whose immunity is weakened may not visit you during isolation. If you have drug resistant TB, visits by persons under 16-years of age are prohibited. When you cough you can put TB bacteria into the air. When you are coughing, please cover your mouth and nose tightly with a disposable tissue. Put it in a waste basket after use. If you need to leave the room during isolation, use a face-mask and cough tightly into your upper arm/sleeve. In this way you can prevent the spread of bacteria.